small three indicator as small as 1.5mmφ. Best suited for temperature control of electronic and electric parts like transistor, IC, capacitor and small motor. Color change method utilize melting point of refined stable meltable pigment to achieve high accuracy. Apply where temperature monitoring is required. Do not rub the color changing part. This may cause abnormal color change. Apply on a clean and dry surface. Apply on flat surface. THERMO LABEL® SUPER MINI 3K might drop from uneven applying surface. Avoid applying on curved surface and bending indicators. Do not cut THERMO LABEL®SUPER MINI 3K. This may reduce the durability of product and cause abnormal color change. Outdoor use: THERMO LABEL ® SUPER MINI 3K is not designed for outdoor use. Store unused indicators under room temperature and dark condition Avoid high temperature and excessive humidity. The color change temperature and its accuracy were determined in room temperature with 2-3℃/min of heating rate. Under special condition, color change temperature might be changed. 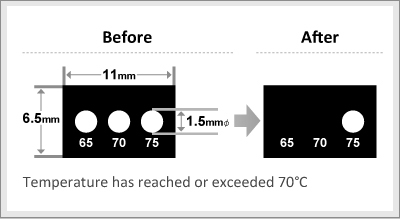 The color change element which color change temperature is greater than or equal to 130℃ might cause performance shift by heating in high temperature longer than 1 hour. Remove water, oil, rust and dust from the surface before applying labels. Contamination and uneven surfaces can cause labels to drop and abnormal color change. Remove release film and apply where temperature monitoring is required and press the surface of label gently with finger or cloth. Strong rubbing might damage the label and affect performance (abnormal color change). Apply labels on flat surface. Labels are not designed to apply on curved and corner surface. Do not change shape of products. Cutting products with a cutter knife or re-shaping can reduce the durability and cause abnormal color change. Do not use　electromagnetic induction heating, for example, microwave oven, under high pressure condition and high vacuum condition. Do not use in outdoor. THERMO LABEL SUPERMINI 3K is not designed for outdoor use. Do not use THERMO LABEL SUPERMINI 3K under liquid (such as water, oil, grease, plasticizer* or solvent) affected condition. 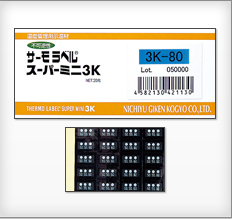 When THERMO LABEL SUPERMINI 3K absorbs the liquid, indicator may change color and/or may impact adhesion of THERMO LABEL SUPERMINI 3K. *Plasticizer may be contained in insulating coating of electrical cable, terminal cap and vinyl chloride resin. THERMO LABEL®SUPER MINI 3K contains no toxic substance according GHS classification except from 3K-110. Please refer to MSDS of appropriate products for detail. THERMO LABEL®SUPERMINI 3K doesn’t contain chemical substance prohibited in the RoHS directive. Immediate health, physical, and environmental hazards: The environmental properties of this product present a low environmental hazard. This product, when used under reasonable conditions and in accordance with the directions for use, should not present a health hazard. However, use or processing of the product in a manner not in accordance with the product's directions for use may affect the performance of the product and may present potential health and safety hazards. The information in this sheet is believed to be correct as of the date of issue Nor the selling, nor the producing company make no warranties, expressed or implied, including, but not limited to, any implied warranty of merchantability or fitness for a particular purpose or course of performance or usage of trade. The user is responsible for determining whether this product is fit for a particular purpose and suitable for user's method of use or application. Given the variety of factors that can affect the use and application of this product, some of which are uniquely within the user's knowledge and control, it is essential that the user evaluate this product to determine whether it is fit for a particular purpose and suitable for user's method of use or application. *THERMOLABEL, RETOMARK, MEDESHILL, UVLABEL, DEWLABEL and Thermo-Paint in all the contents including digital catalog in this website are registered trademarks in Japan of NiGK Corporation. is registered trademark of NiGK Corporation, in Japan,New Zealand and Philippines. isregistered trademark of NiGK Corporation, in Japan,Australia,European Union and Switzerland.